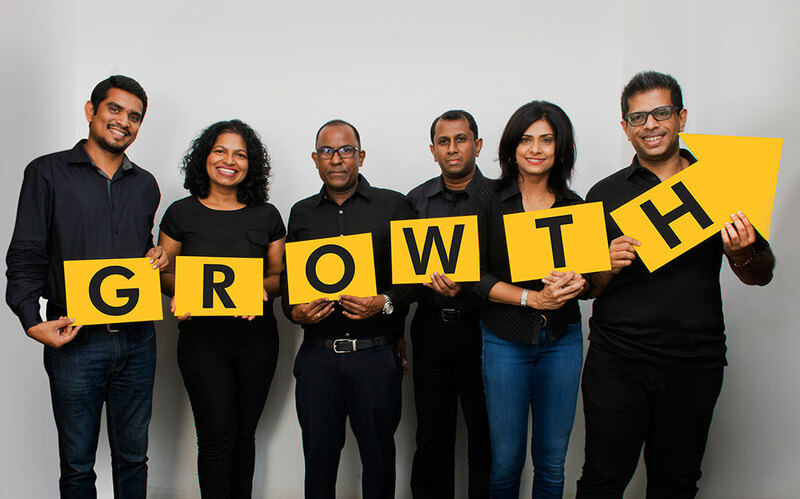 Sarva Colombo > Growth buzz > Sarva Colombo strengthens team to incite further growth for their clients. (From Left to Right) Imesh Goonewardene, Chief Operating Officer; Rozaine Cooray, Behavioural/Organisational Psychologist; Naresh Abeyesekera, Financial Strategist; Dharshana Senerath, Director- Brands; Sharmila Cassim Captain, Chief Strategy Officer; Chrishantha Jayasinghe, Managing Director. Now geared to provide 720-degree solutions, including culture transformation. Sarva Colombo announced the strategic expansion of its team with a few key members to enhance its position as a total growth solutions provider further. Coming on board is Sharmila Cassim Captain as Chief Strategy Officer, Rozaine Cooray as Behavioural/Organisational Psychologist and Naresh Abeysekara as Financial Strategist. In addition, Dharshana Senerath joins as the Director- Brands for the agency, while former Director of Client Servicing for Sarva Colombo, Imesh Goonewardene, assumes the role of Chief Operating Officer. With over 20 years in Strategic Marketing Consulting and Brand Management, Sharmila Cassim brings a wealth of experience to the team. A former Head of Marketing for CIC Paints, Project Manager for ICI Paints, Asia Pacific and a key player in the market dominance of a range of Homecare products at Reckitt Benckiser Lanka, Sharmila holds an MBA from the Postgraduate Institute of Management. Her forte includes Business Process Transformation for one of the world’s leading Consumer and B2B organisations. Joining as Behavioural/Organisational Psychologist, Rozaine Cooray is the founder of Forté Consultancy; a Business psychology consultancy that offers people-oriented solutions to organisations. With her expertise, Sarva Colombo will be able to go beyond understanding consumer demographics, to understanding consumer psychology; giving the agency a comprehensive insight into the minds and behavioural patterns of consumers. Her role extends to working closely with Sarva’s clientele to ensure core brand messages are understood and delivered at customer touchpoints. MBA-holder and seasoned brand builder Imesh Goonewardene has grown with the agency over the last 13 years, starting off as a young Account Executive, to now entering the rank of Chief Operating Officer. Imesh has a multitude of experience in managing brands and has been integral in driving brands such as Denta, DIMO and NDB to market dominance. As Chief Operating Officer, he plays a significant role in setting and monitoring organisational KPIs and ensuring overall profitability. As the Director- Brands, Dharshana Senerath brings a wealth of business acumen, accumulated over 25 years in international and Sri Lankan private sector companies. A qualified management accountant, fellow of the Chartered Institute of Marketing (UK), and MBA graduate, he has held senior management positions in multinationals such as Tetra Pak and Nestlé, and is also a resource person for the Sri Lanka Institute of Marketing (SLIM). Lastly, former Group CFO of MilleniumIT and part of the leadership team of the London Stock Exchange Group, Naresh Abeysekara, joins the team as Financial Strategist. The founder of SECQUORO, a business transformation-oriented company and previously, one of the youngest CFOs of a company whose turnover exceeds US $100 Million, Naresh is a systems and processes expert who understands bottom line responsibility and helps entrepreneurs harness new opportunities and overcome threats created by the new world economy. The 13-year old agency has a reputation for effective growth-driven communications through strategies and insights based on research, many of which are conceptualised in Sinhala and Tamil. It is known for delivering exceptional results for high calibre brands in the banking and non-banking financial sector, and in the educational, telecommunications, medical, automobile and FMCG industries, respectively. Backed by a passionate and talented team, Sarva Colombo maintains that effective advertising is the only advertising worth paying for.